Neuroplasticity is the means by which the brain is constantly adapting and changing throughout your life. When it comes to hearing loss, your brain learns to adapt by allowing you to use other senses to make up for what you cannot hear. However, when it comes to hearing, this rewiring can prove to be a bad thing because so much mental effort is diverted toward understanding speech. But Jamie Desjardins, PhD, an assistant professor in the speech-language pathology program at The University of Texas at El Paso, showed that hearing aids improve brain function in people with hearing loss. To explore the effects of hearing loss on brain function further, Desjardins studied a group of individuals in their 50s and 60s with bilateral sensorineural hearing loss who had previously never used hearing aids. Study participants took cognitive tests to measure their working memory, selective attention, and processing speed abilities prior to and after using hearing aids. After two weeks of hearing aid use, tests revealed an increase in percent scores for recalling words in working memory and selective attention tests, and the processing speed at which participants selected the correct response was faster. By the end of the study, participants had exhibited a significant improvement in cognitive function. This study reinforces the old adage, “if you don’t use it, you lose it,” and it’s particularly concerning because some people have hearing loss without ever realizing it. Phone conversations are challenging to hear. You find it hard to track conversations when two or more people are conversing. You find yourself asking others to repeat themselves often. You notice television volume needs to be at a level that is too loud for others. Background noise interferes with basic hearing. Other people’s voices may seem muffled. You have a hard time hearing women and children’s voices. A hearing test is painless and takes less than an hour. Untreated hearing loss increases your chances of falling. Treating hearing loss with hearing aids is believed to reduce the risk of cognitive decline. Untreated hearing loss is known to contribute to depression, social isolation, and cognitive decline. 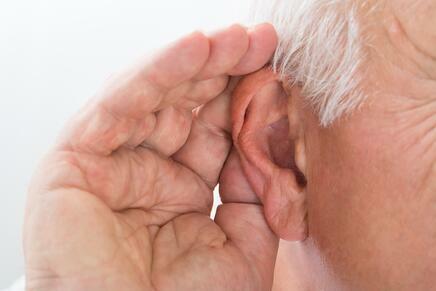 It is so important not to chalk up hearing loss to a natural progression in the aging process. Consider this, having hearing aids and not using them is just like having sunglasses and not wearing them while squinting when the sun is shining. Both can adversely affect your personal well-being. Remember it’s not just about hearing loss, it is about exercising your brain and taking precautions for a healthy future.